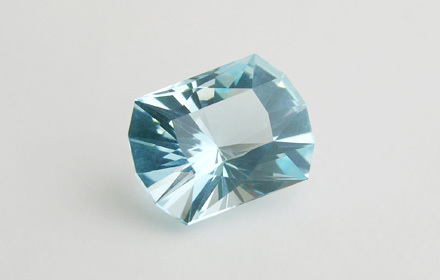 Weight: 2.90 ct; size: 9.60 | 7.17 | 5.85 mm; shape: cushion; colour: very light very strongly greenish blue; clarity: eye clean; cut: excellent; treatment: irradiation. Very clean specimen; excellent brilliant style cut. Source: Jeffery Davies, Jeffery Davies Fine Jewelry & Gemstones.